Stephen Coughlin was interviewed after his speech in Los Angeles at the American Freedom Alliance conference, “Islam and Western Civilization: Can they Coexist?” He discussed how Islamist matters have been treated under the past two administrations, and what the prospects are for improvement under either a Democrat or Republican administration. Interviewed by Canada’s The Rebel website co-founder, Stephen Coughlin says too often our political leaders are acting out of political considerations and ignoring the obvious facts in front of them. He also talks about how the refugee crisis could be exploited by ISIS. 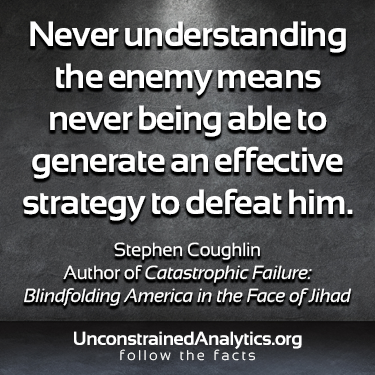 Is America Being Blindfolded in the Face of Jihad?